You are currently browsing the tag archive for the ‘Cynar’ tag. I am excited for my trip to Milan. I love Italy. I love traveling. But I hate packing. What to bring? What to leave home? With piles of clothes and a few too many pairs of shoes covering my bed, I decided a cocktail might take the stress out of this process. It was only appropriate to get inspiration from Italy. 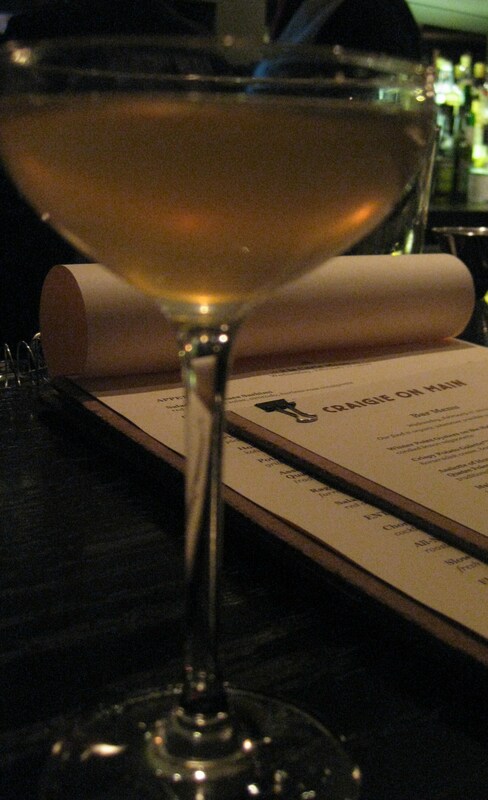 I chose Cynar, a tasty Italian bitter made from 13 plants and herbs. The most prominent ingredient is artichoke—yes, artichoke. The taste is in fact bitter, as it should be, but there’s also an earthiness and butteriness from the artichoke that make it interestingly smooth. To propel me through my packing woes, I made a refreshing and delicious Cynar Sour. It hit the spot perfectly and my suitcase eventually got packed. 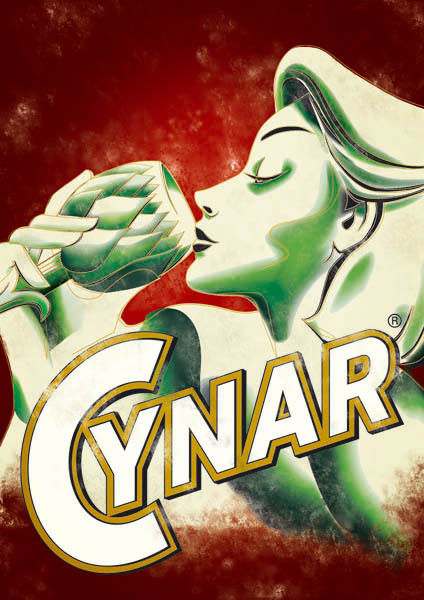 To further procrastinate from packing, I found this fun commercial for Cynar. L’amaro vero, ma leggero. I look forward to enjoying Milan’s famous apertivo, the evening cocktail hour, and visiting Fernet Branca and Campari. So, expect a full report upon my return. Salute! I love when a weekend from which you expect very little ends up being a great one. Not only did I enjoy great drinks at Drink and Deep Ellum with good friends, but I also learned a little bit about sweet vermouth and Swedish Punsch. While I am sure most people have at heard of, if not enjoyed, sweet vermouth, but many may be asking “What is Swedish Punsch?” I asked the same question during my first visit to Deep Ellum a couple months ago. Max answered the question for me, and now I will answer it for you. But first, let’s talk about sweet vermouth. Friday night after work, Julie, Bridget and I went to Drink. After enjoying a a delicious mulled spiced wine, I asked Josey for a Little Guiseppe. This drink features Cynar, an artichoke based liqueur (it may sound strange, but trust me, its good stuff—buttery and complex) and sweet vermouth. 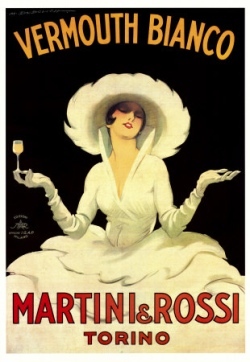 As I enjoyed this rich drink with a flavor like nothing you can quite imagine, I asked Josey which vermouth she used. Before I knew what was happening there were 4 small glasses lined up in front of me and Josey was gathering bottles. And the lesson began. 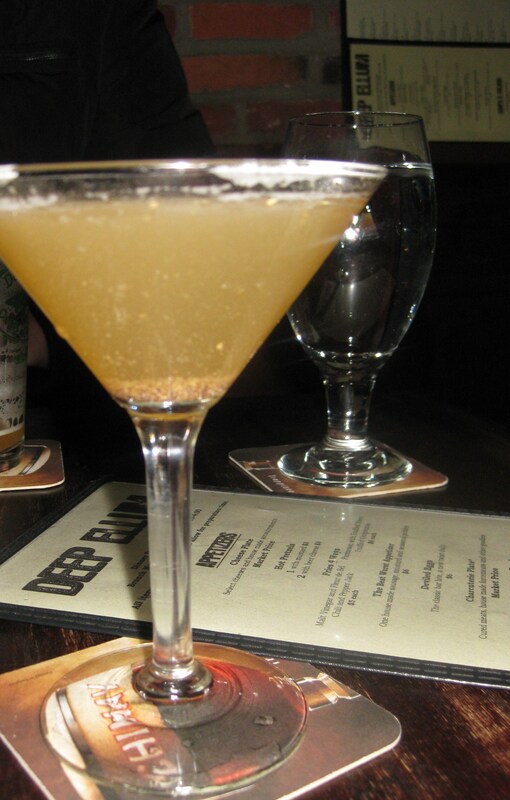 We began with the basic—Martini and Rossi. She explained it was heavy on the oregano flavor which if you like oregano is a good thing, but doesn’t work in all cocktails. 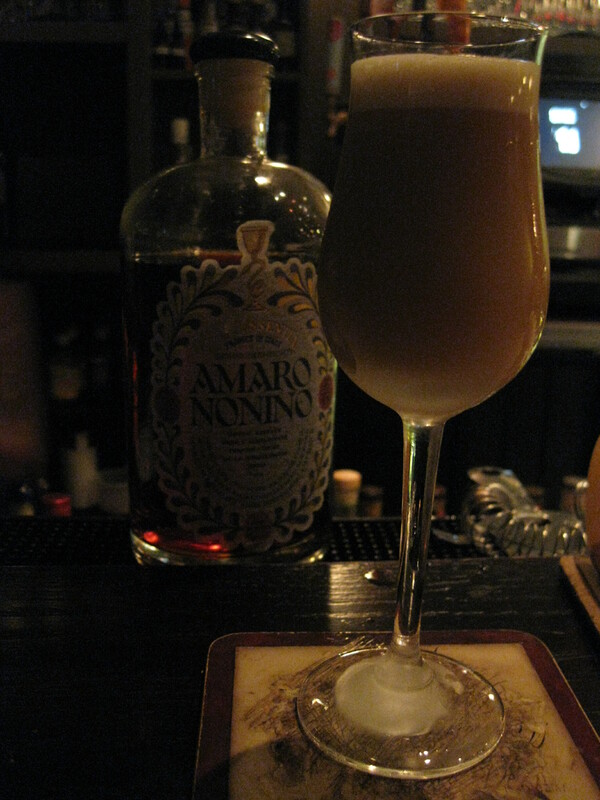 Next came the Cinzano (which is what she uses in the Little Guiseppe), an Italian vermouth whose recipe dates back to the late 18th century recipe developed by two brothers in Turino. It is herbally and slightly sweet. Then we tried Punt e Mes. Like just about all vermouth it is made with white grapes, so you taste a sweet cola-like flavor. But the wormwood here adds more bitterness at the end than the others. 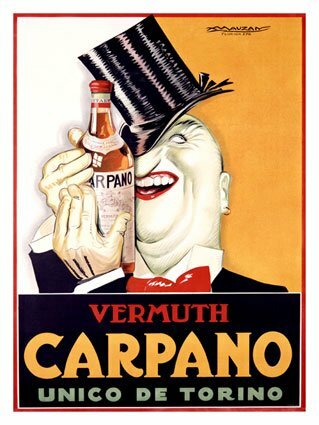 The 4th and final vermouth, we tried was Carpano Antica. This was by far the best—after one sip, you just wanted more. Phil and I compared the flavor to a port. We also learned (and maybe everyone else knows this, but I didn’t, so I’ll share) to store vermouth in the refrigerator. It’s made from grapes like wine, with a spirit added plus herbs and barks for flavor, so it doesn’t have a shelf-life like pure spirits and keeps best in the fridge. This little impromptu lesson on sweet vermouth from Josey is one of the many reasons that I love Drink. You go in for a couple cocktails with friends and leave having expanded your palette and mind. Stir. 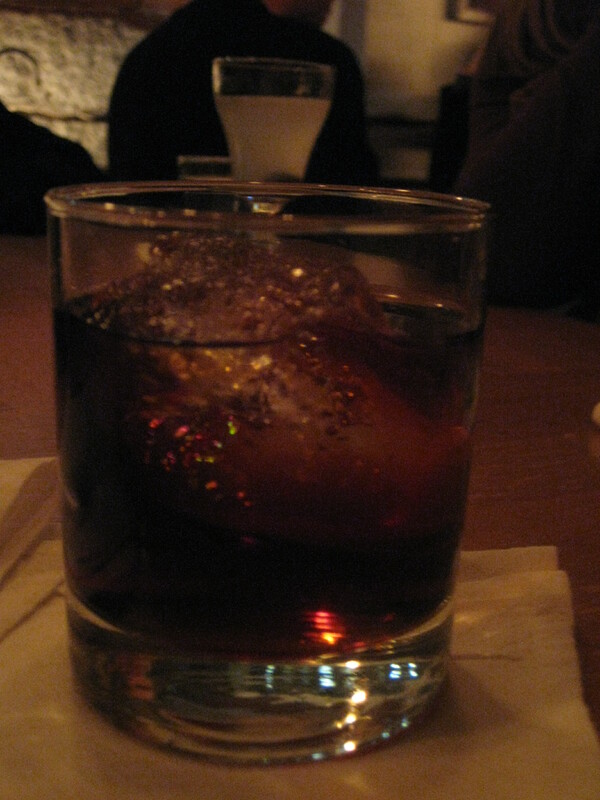 Serve in double old-fashioned glass with big chunk of ice. Add pinch of coarse salt. So, Deep Ellum is quickly becoming one of my favorite places—killer cocktails, great beer selection, amazing food, and fun, knowledgeable staff. 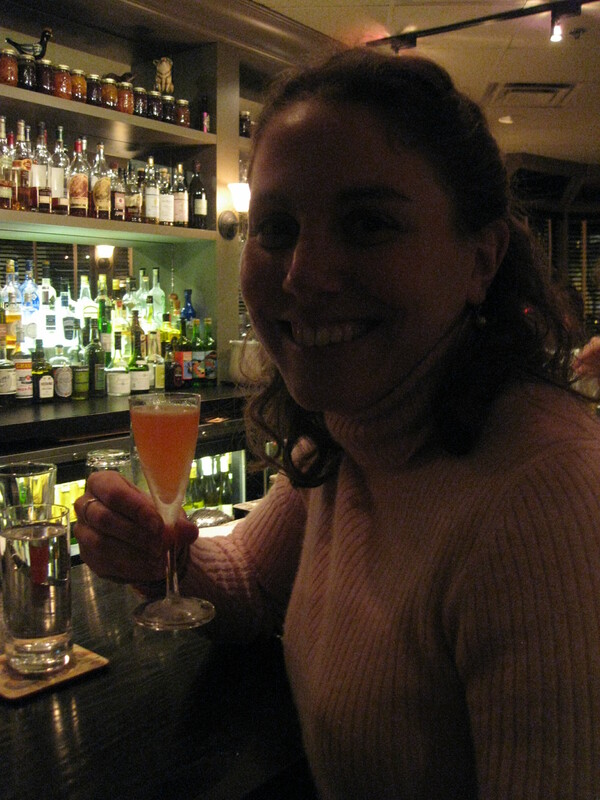 One each visit I have been treated very well by Max Toste, one of the owners, and bartender Casey Keenan. This Saturday night with Holly, Julie and Jim was no exception. Deep Ellum may be the only place in Boston where you can get this amazingly delicious stuff called Swedish Punsch. 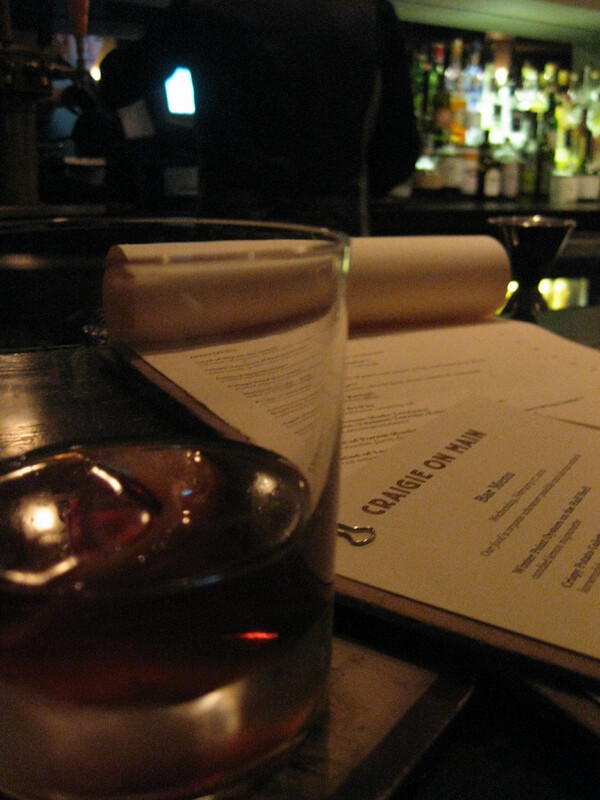 [They also have a great selection of Manhattans–10 ways. I think those deserve their own post, so more on that later.] Originally developed in Sweden in the mid-18th century, Max has revived this almost forgotten concoction (its so good, his recipe was recently featured in Imbibe magazine). The main ingredient is Batavia-Arrack, an Indonesian spirit made of sugarcane fermented with red rice. It’s a South East Asian version of rum. To that, simple syrup, lemon juice, nutmeg and cardamom are added. This is one of the most delicious things I have ever had the pleasure to drink. You taste the rich, smooth sweetness of the Batavia Arrack followed by the wonderfully distinct spiciness of nutmeg and cardamom. I enjoyed the Swedish Punsch three ways. First, I had a Hesitation which is equal parts rye whiskey and punsch; then I had a Waldorf, equal parts gin and punsch. For my final punsch cocktail, I had a Contraband—gin, Batavia Arrack, Swedish Punsch, Agwa Coca leaf liqueur, and absinthe. While all of these were tasty, the Waldorf was my favorite because the flavor of the Swedish Punsch really shines here because it doesn’t really have to compete with any other flavors. The gin adds a nice, subtle background but allows the punsch to shine—which it totally deserves! So, here’s to a weekend of good drinks with a little learning slipped in. Cheers!